Here are more pictures from the second day I spent ice dyeing this time using Robert Kaufman’s pfd Panda – 60% cotton, 40% bamboo. 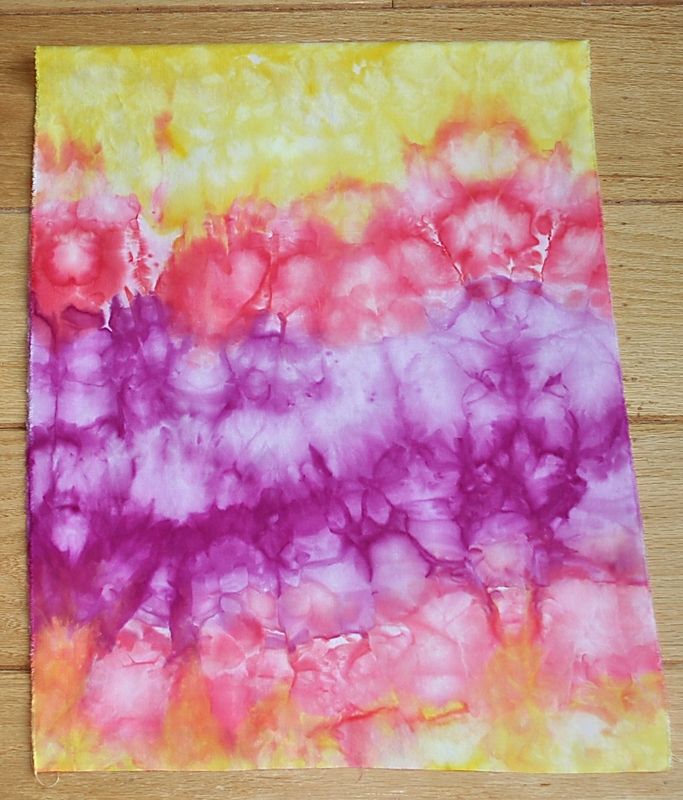 I also used a screen to lift one layer of fabric above the melted dye solution, and this was dyed with the concentrated dye solution I talked about in the previous post. I’m sticking to my word and not sprinkling powder around anymore. 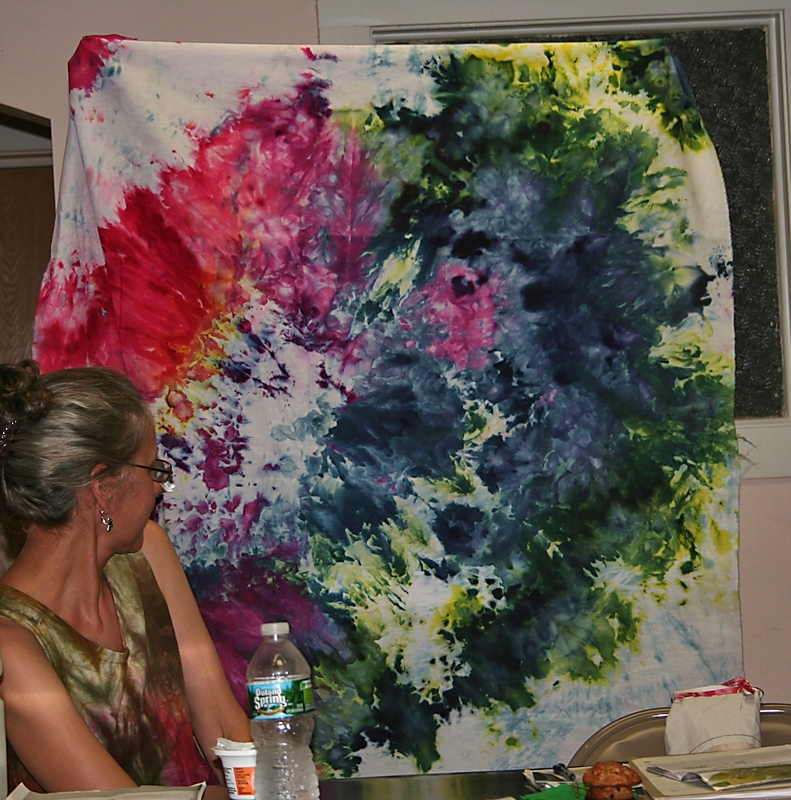 Keeping the fabric from soaking in the dye solution creates a very different look with ice cube dyeing. You can actually “see” the cubes in the pattern. Everywhere there is a little lighter space surrounded by deeper color, there was an ice cube. I really like this look and will definitely use a screen for future ice dyeing. You might be able to see the lettering on the bottom of these fabrics that indicate one was put in dry – soaked in soda ash and then dried, and the other put in wet. This time the difference was neglible, but I do believe the dried piece is a bit darker than the wet – not enough to make me want to dry this fabric before I dye it though. I almost forgot. This batch was batched for a full 24 hours, then soaked in cold water for another 24 hours, then washed in hot water, and rinsed in cold water, and when I rubbed the wet fabric against a white towel, the towel stayed white. 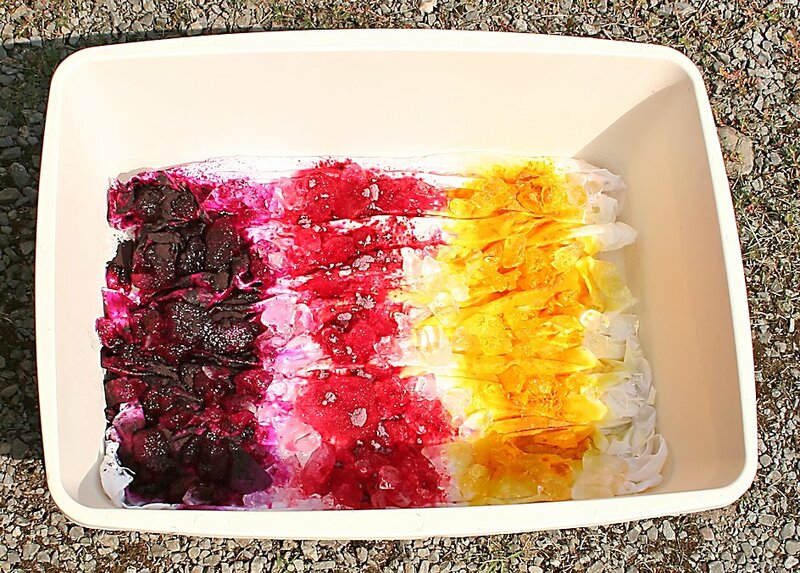 We’re enjoing lots of sunshine and warm weather, so I thought I’d indulge in something I’ve wanted to try for a long time – ice dyeing. It’s actually been all the rage for a few years, but I finally got a block of time to try it. Quite a difference in color take up, true? And it occurred the exact opposite the way I thought it would. The top fabric was soaked in soda ash and put in the container wet, the bottom fabric was soaked for the same length of time as the top fabric, but dried and placed in the container dry. I honestly thought the liquid in the wet soda ash fabric would act as a resist. Obviously, it acted exactly the opposite, and soaked up the dye quickly and deeply. The fabric was put in the container in one layer. 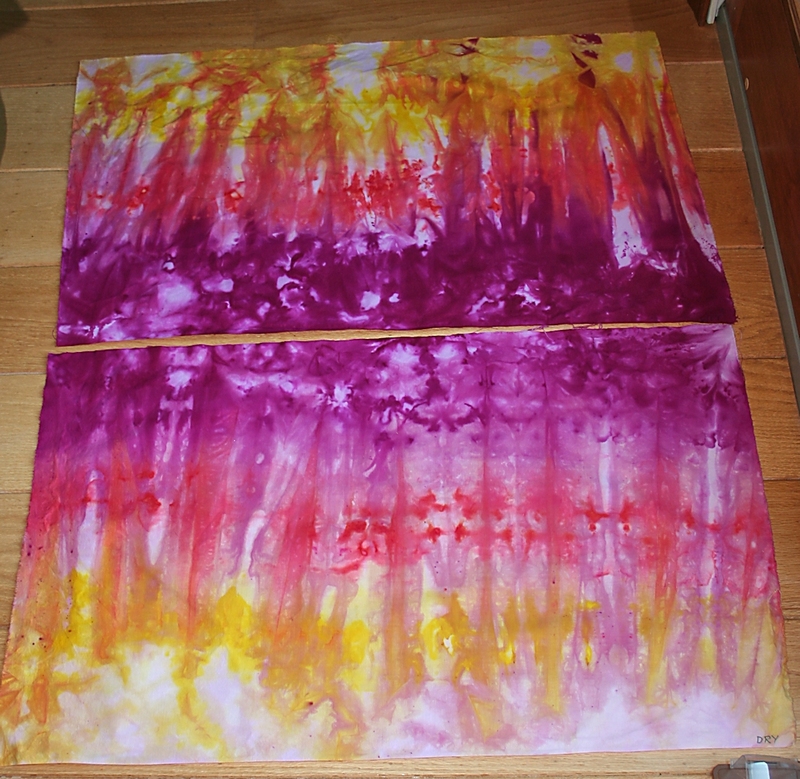 As you can see from the first photo, the sprinkled dye was pretty evenly distributed. The container stayed on a flat surface, so it’s not like the melted dye solution was on just one piece of the fabric. This leads me to conclude that if you want dark colors, you can put in your soda ashed fabric wet. I do wring it out very well, so it’s not dripping wet. This was a welcome discovery, as it’s a PITA to soak fabric in soda ash, and line dry it since my husband removed my outdoor clothesline pole. This is one step I don’t have to do anymore. 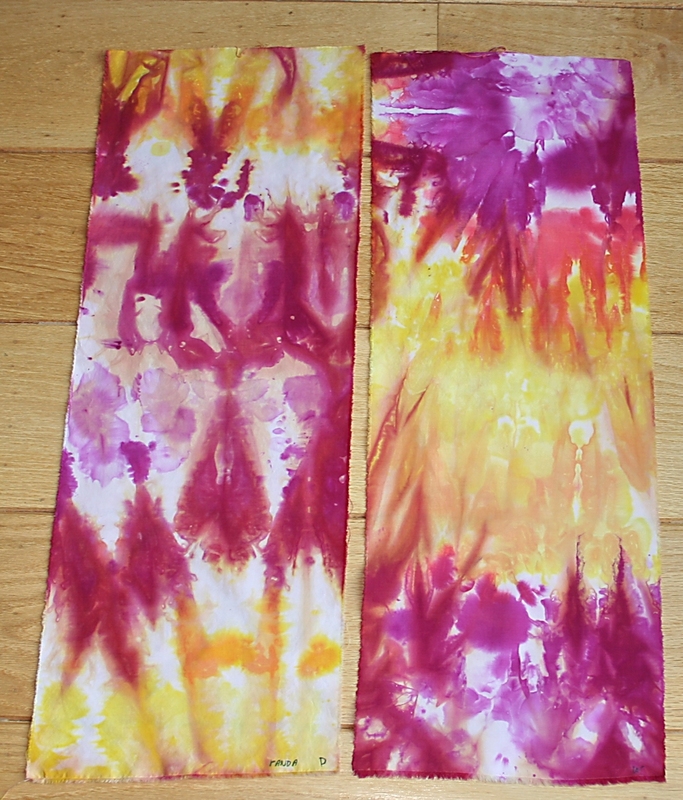 I well and truly hated sprinkling the dye powder on the fabric. It’s dowright dangerous. I could not believe how that powder migrated, and there was hardly any wind the first day. It was hot, I didn’t like wearing my mask in the sun, and I didn’t like the waste. The second day I decided to mix up a nice strong dye solution. I was using old packages of Dye It for some of the colors, and the Lemon Yellow weighed 7.4 grams. I put that in a squeeze bottle along with 120 ml (1/2 cup) of water. The other dyes were in containers from Pro Chem and I weighed out equal amounts of Pro 3216 Rosebud, and Pro 802 Boysenberry for the other squeeze bottles. Shake shake shake, shake shake shake, shake your booty – or in this case, your dye container. LOL That song always comes to mind when I’m shaking the bejeebers out of a dye solution, and I happily sing it, and dance around the laundry room/dye studio as I’m mixing the dye – one in each hand. Now, I’m a happy camper. No more shaking dye powder outside for me. 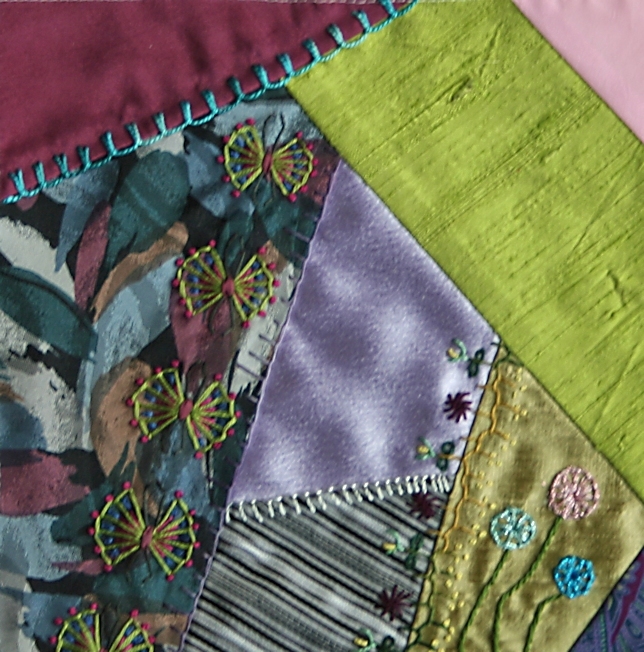 A friend did come over for the third day of ice cube dyeing, and we worked together on her fabrics. She chose to do the dye powder sprinkle method, but I’m done with that. I much prefer using the dye solutions. It’s safer to mix the dye solution inside my dedicated dye space in my nice AC’d house, I still got great color and patterns, and there is much less outdoor clean up. No hose needed to clean off the table surface. I had put plastic down over two doors arranged on some saw horses, and you would not believe how that powder managed to spread over the entire length and width of the surface, and even onto the grass. I have a nicely dyed toenail from the experience also. In a couple of days, I’ll have more photos to share. 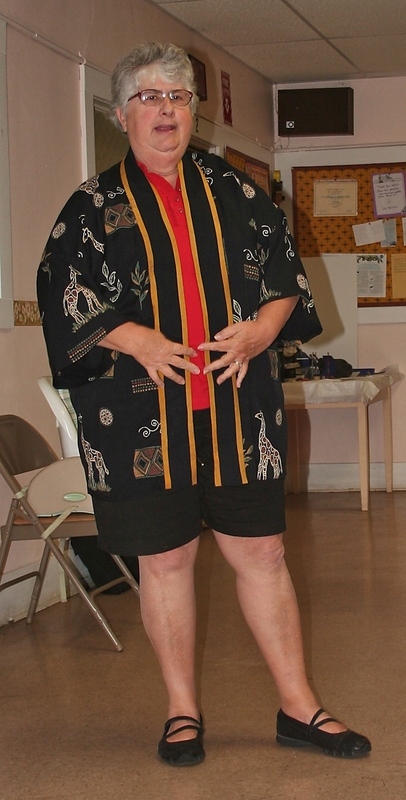 I used different colors, different fabric, and dyed some pants too – solid color for the pants. 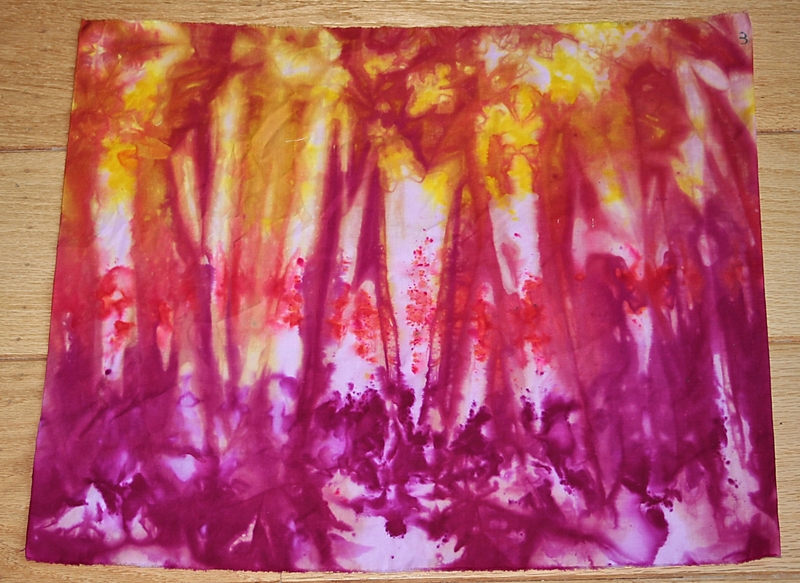 And if I’m really motivated, I might do some dye painting with thickened dye solution. Lucy kindly typed up instructions for us on how to create triangles, and also showed us how we could make it into a square. Adding more beads along 2 of the sides would create a rectangle. The best part of this demo was once you understand the corner turning technique, you could make just about any geometric shape you’d like. Thank-you so much, Lucy. 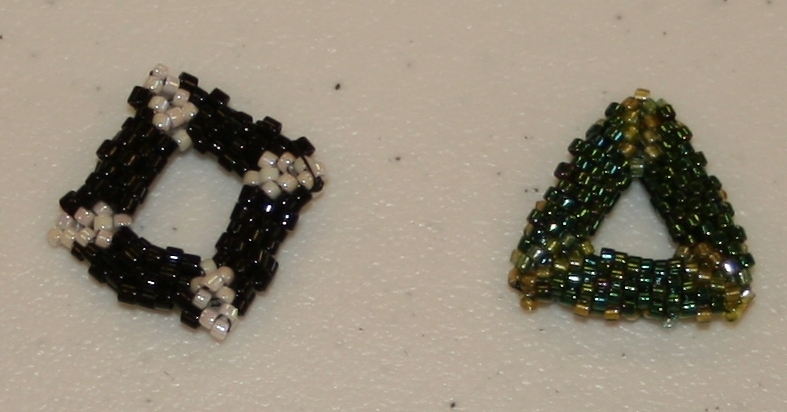 I had my hands filled with creating the triangle bead though, and you will most definitely see these in a future project. Only Sue knows what I plan on doing with them, but I want to surprise the rest of you. There was quite a difference in size. 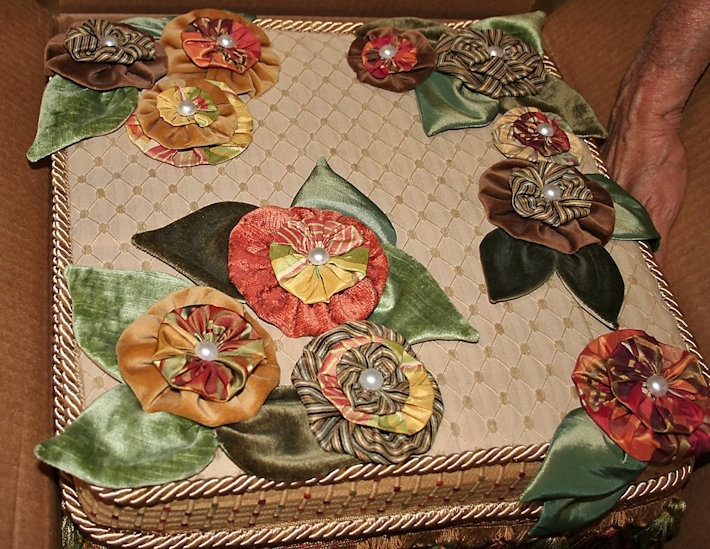 Karen’s (on the left) did add an accent bead along the edge, but even without that, her bead was larger. She used Dynamite 11/0 Matsuno Matte Transparent beads and I used Delicas 11/0 Miyuki Silver-Lined Crystal and Color-Lined Sapphire beads. We both purchased our beads from Fire Mountain. I have not done a lot of beading and foolishly thought all 11/0 beads were the same size. Guess you learn something new everyday, and this little tidbit of new knowledge is darn important. Imagine if you were ordering a lot of beads for a project, and you wanted a uniform look, but ordered from different bead lines. Uh-uh, you wouldn’t end up with a uniform look. Now that would be fine for a free-form piece, but if you wanted a consistent look, that could be a potential pitfall. 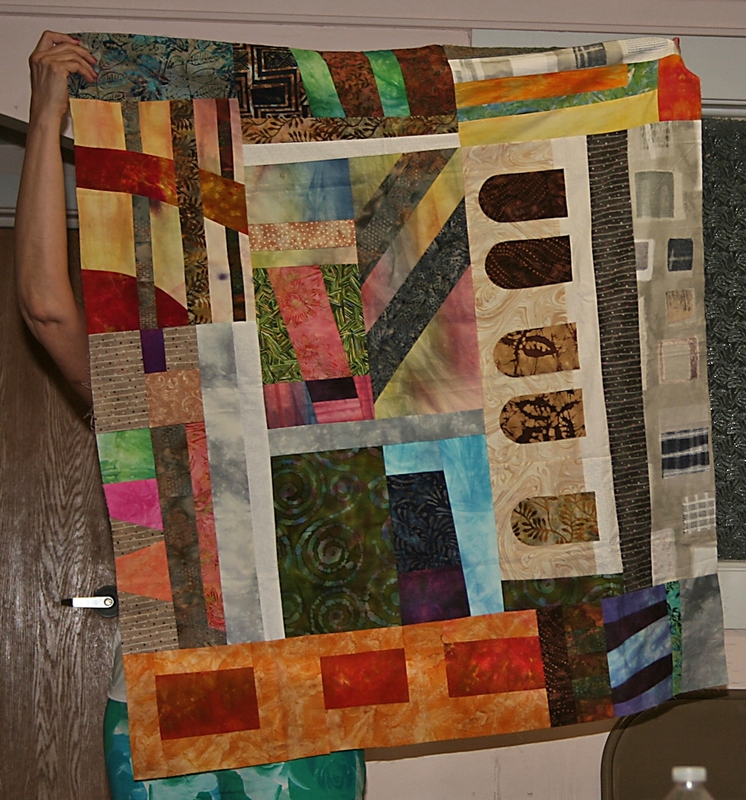 August is always an anticipated meeting as lots of members have attended Quilting By the Lake and bring their works in progress for Show and Tell, and there was plenty of eye candy for all to enjoy that I’d like to share with all of you. We were in the middle of a drought, so Glynnis thought it was safe to spread the fabric out on her deck and let it batch overnight. Now you know what’s coming don’t you? Glynnis and her ice dyed fabric are totally responsible for breaking our drought. My garden plants thank-you very much Glynnis, but I can’t imagine it was any fun getting up at 2am to rescue your fabric from the downpour. Is that not drop dead gorgeous? It’s so elegant. 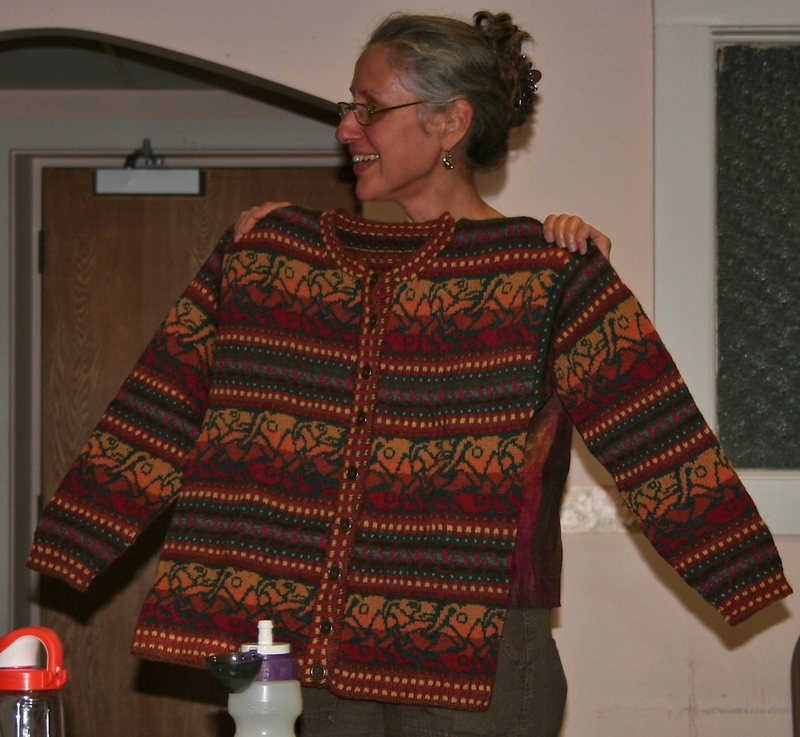 She took a class with Judy Blaydon. The class was based on a photo each student brought in, then had it changed to black and white, cut it apart and collaged it, then interpreted it in fabric. 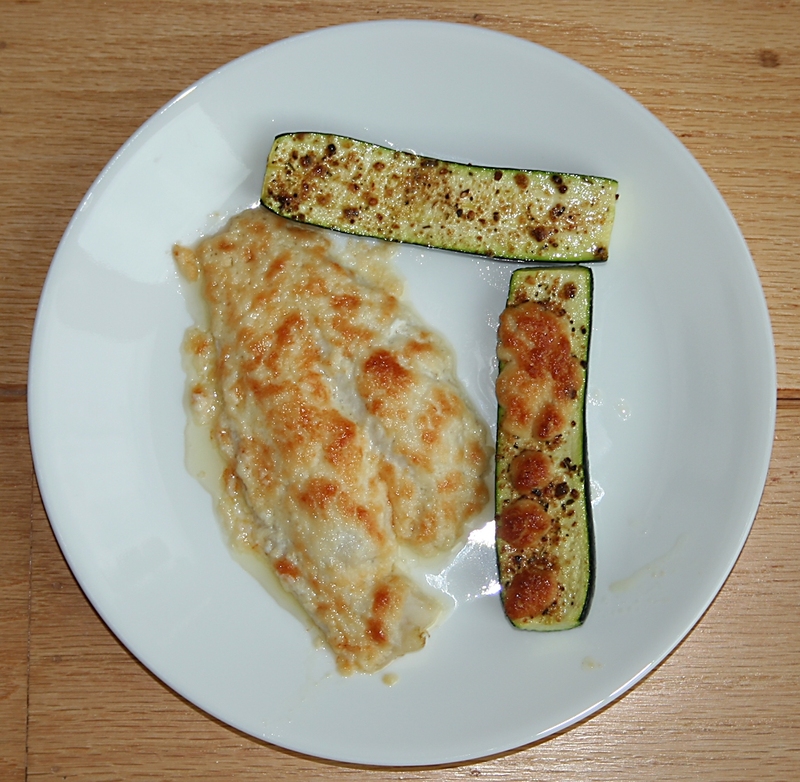 I just realized that I only have a couple of photos in this post from pieces started at QBL. That goes to show that our group is always creating. Yeah for all the RAFA members!!! BAS Merle’s Second Block and What’s Cooking? It took me forever to finish this block. The reason? I was stumped about adding something to the previous embroidery. I managed to add a tiny gold stitch over the bars of Rose Anne’s white herringbone stitch, but that white stopped me in my tracks. 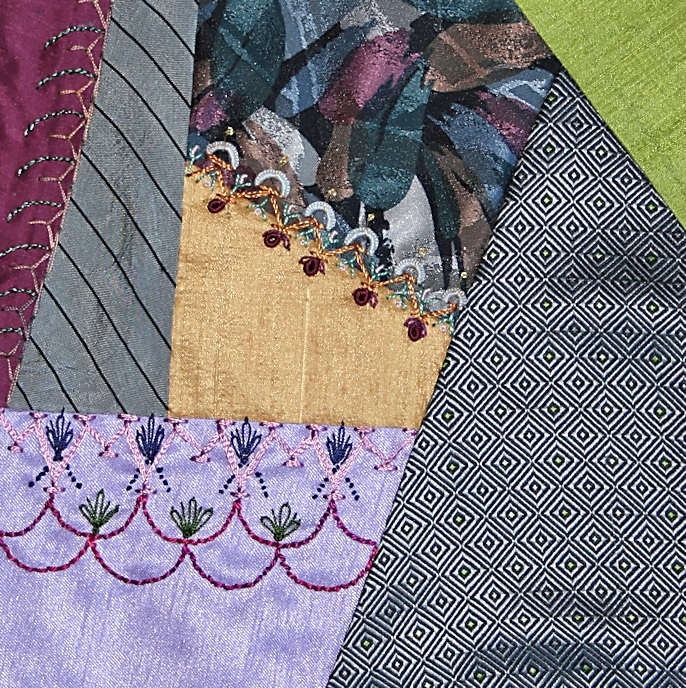 It’s a very nice seam treatment, and the colors work well with the block, and I was happy with the little bit of gold I added to it, but then I hit the proverbial embroidery wall. Oh, I could have added beads to those little blocks on point, but these blocks have to be shipped to Australia, and beading makes for expensive shipping. 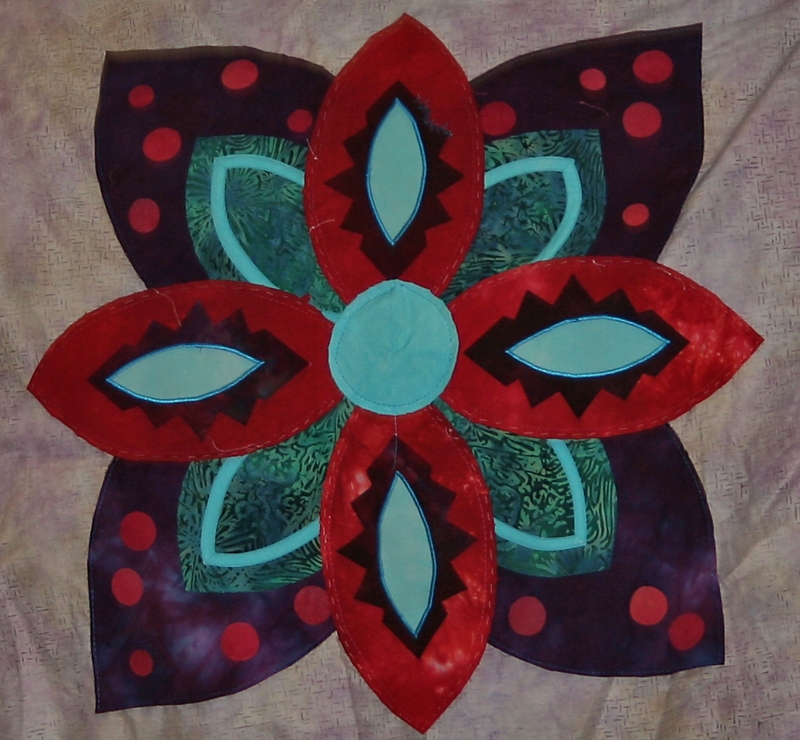 Plus, I used beads on the previous block, so didn’t want to use them on this one too. My contribution to Merle’s beautiful block was the previously mentioned little straight stitch on the white blocks with 3 strands DMC Precious Metal E3852. 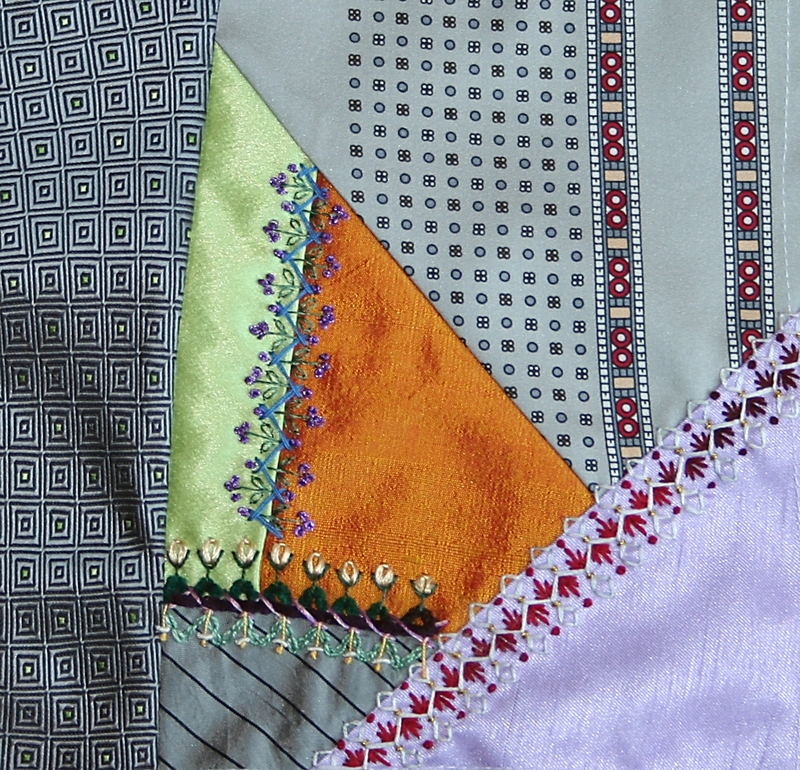 Then a brand new Herringbone stitch over the light green and red/orange silk pieces withe 2 strands YLI Jeans Stitch # 9. Followed up with a straight stitch and 2 detached chain stitches to form a stem and leaves with 1 strand DMC Rayon # 30501. And last but not least, finishing off with French Knots made with 2 strands DMC Jewel Effects # E3837 – wrapped twice around the needle. I like the color combinations I used, and have to say, I hate stitching with DMC Jewel Effects metallic thread, but love how it looks. With my wonky eyes, a needle threader was necessary, plus the thread splits and frays easily. 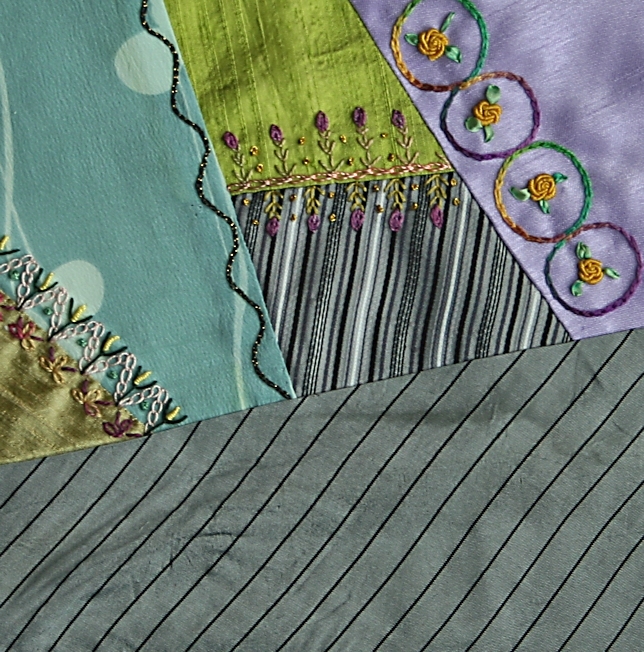 Using shorter thread lengths solved the splitting and fraying issue. Only God or my surgeon is going to fix my wonky eyes, and I’m hoping it’s God who takes over that job. I’d just as soon avoid having retina surgery, thank-you very much. I hope you’ll like what I added to your block, Merle. 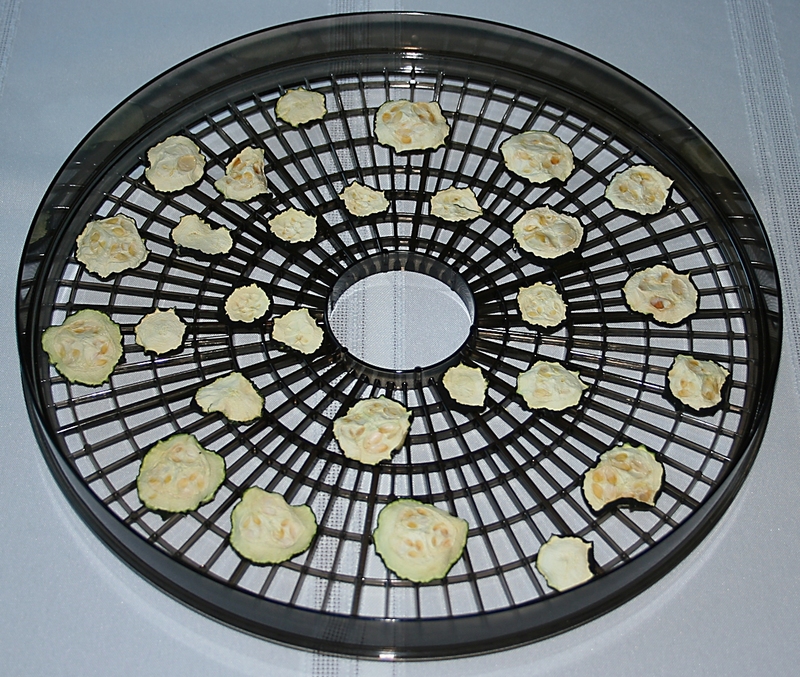 The beauty of dehydrating veggies is it’s darn easy. As a person who has canned, pickled, blanched, and frozen just about every veggie and fruit that grows in Upstate New York, this is a neat way to preserve garden produce. It doesn’t have to be stored in the freezer, so if you lose your electricity, it’s no big deal. You don’t have a lot of heavy glass jars filled with food that might or might not have sealed either. It takes just a little electricity, and you don’t have to spend the hottest days of summer over a hot stove. That’s a win-win in my book. I only have one more batch to go and will have enough for the entire winter. 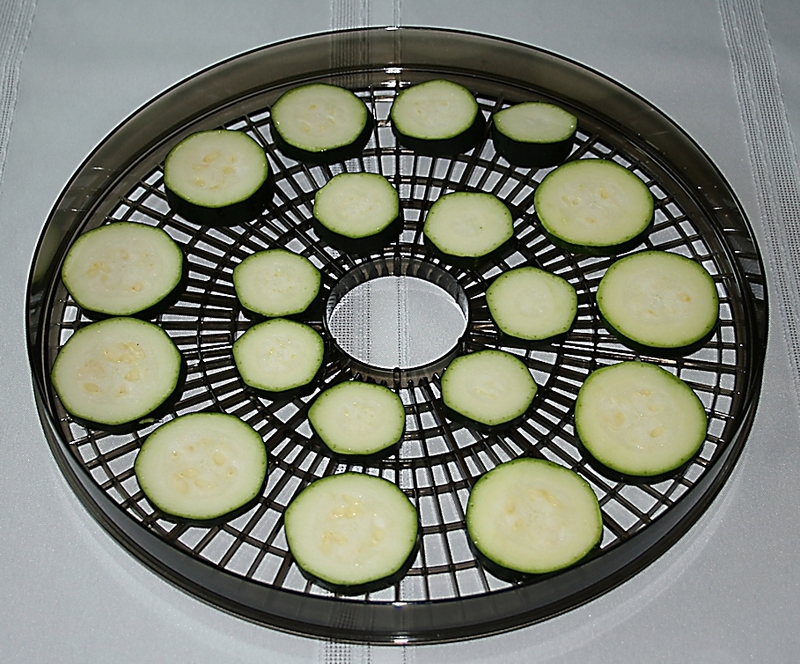 Yeah for that dehydrator because it will be needed for tomatoes soon.